JUST A note here to inform anyone who might stop by my Peanut Road site (peanutroad.com) that it will be offline for a while. I'm in the process of transferring it from MSN to my GoDaddy account and will eventually have it forward to pages at my main site. Not that people who come here are looking for Peanut Road nor are people who go to Peanut Road liable to come here looking for it. Unless they Google the name and it shows up. 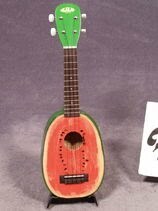 I stopped by Elderly Instruments earlier to buy a decent new saddle for my cheapo Hondo classical guitar -- the plastic one that came with it had snapped in two -- and some banjo strings and couldn't resist this when I saw it... Yep, a watermelon ukulele, soprano-size. The perfect picnic instrument! 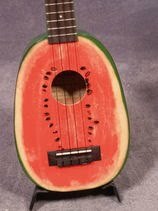 I guess I can play Tiptoe Through the Melons now.